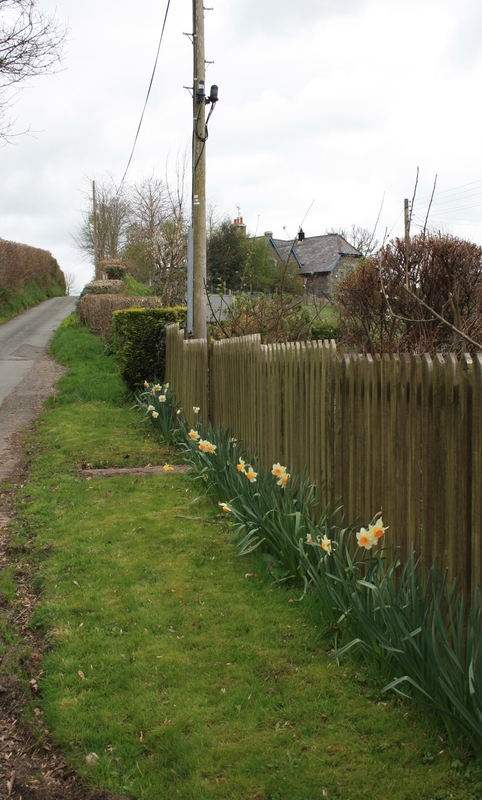 Nantglyn lies about 4 miles to the south east of Denbigh along narrow single track roads. It is the only parish in Wales whose patron is St Mordeyrn, although the church there now is dedicated to St James. It once lay on the route of the pilgrimage trail that followed the route of St Windefride from Holywell to Gwytherin and was possibly thronged with pilgrims. Today it is really not on the road to anywhere, and is easily missed as you pass by on the A543 on the road to Pentrefolas. Mordeyrn was one of the twenty thousand who went to Bardsey, but to set him apart “rather than riding on the causeway which rose out of the sea for the saints’ passage, Mordeyrn crossed on his golden-maned horse without wetting so much as a hoof.” This gained him the name “Sovereign of the Sea”. Mordeyrn later returned to his home at Nantglyn and founded a church there. According to the bard, when he died visitors to his shrine were rid of every affliction and remained healthy for a year. Cures were also obtained for cattle, and visitors arrived laden with “oblations of fine wax and gold”. In the early 19th century both Llwyd  and Lewis  wrote that the chapel at Trewalchmai, near Malltraeth on Anglesey was dedicated to Mordeyrn. However this wasn’t universal at the time and some of their contemporaries gave the dedication used as now, being to St Morhaiarn. Baring Gould and Fisher  fail to identify Morhaiarn although they don’t offer Mordeyrn as an alternative. There appeared to be little of interest at the present church, which if it ever had a dedication to Mordeyrn soon forgot it and acquired a dedication to St James instead. It was heavily restored in the 19th century and was locked on our visit. There is, in the churchyard, an open air pulpit, slate steps and a platform built into an old yew tree. A map showing sites of local interest outside the church optimistically highlights Mordeyrn’s well. St Mordeyrn’s well is marked on the first Ordnance Survey map of the area produced in 1874 and indeed on every issue since that date. I have taken that to imply that around 1874 the well was still there to be known by name and to be seen, since many maps don’t appear on the early mapping, not making an appearance until the early 20th century. Eric Griffiths  does mention that, at that time, some of the older residents remember seeing large stones at the site, suggesting that the well, if nothing remained in 1912, had been in evidence not long before. The Historic Environment Record currently identifies the probable site of the well as being “somewhere under the garden boundary of the police house”. as seen at the top of the post.This garden, although no longer a police house, had recently been dug over at the time of our visit and no sign of a potential capped well, or even moist ground, was to be seen. We did however speak to the neighbour next door. In his garden, at the roadside end, he does have problems with water; the grass there is much darker than elsewhere in the garden and the earth was muddy and soft to the touch. If there were evidence still to be found of St Mordeyrn’s well then this may easily be it. 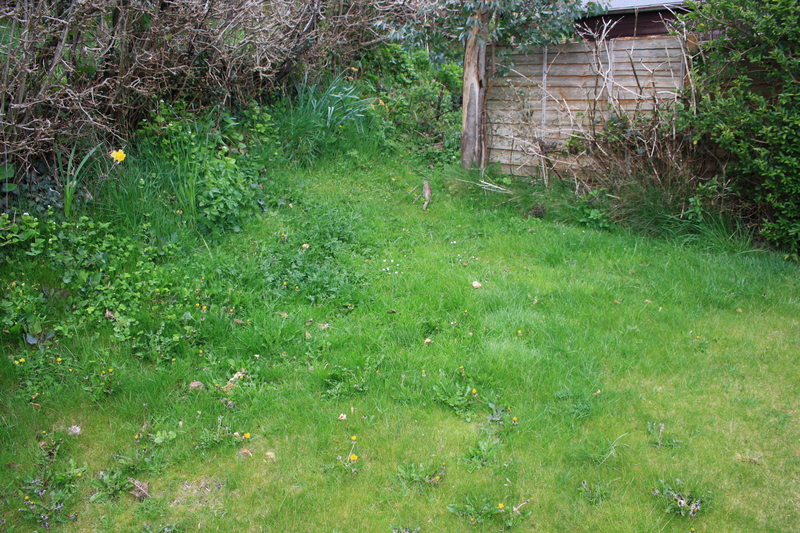 below: a damp patch in the corner of the garden – Ffynnon Mordeyrn’s last remains? There is no information regarding the well in terms of traditions or cures, although the legend is that Mordeyrn carried out baptisms there. For healing and more customs we need to turn to the original chapel, Capel Mordeyrn which stood some 200 yards away as the crow flies to the south east. As with the well, the chapel site is marked boldly on all the OS maps, although also in common with the well the marking is made more with faith than hard evidence. 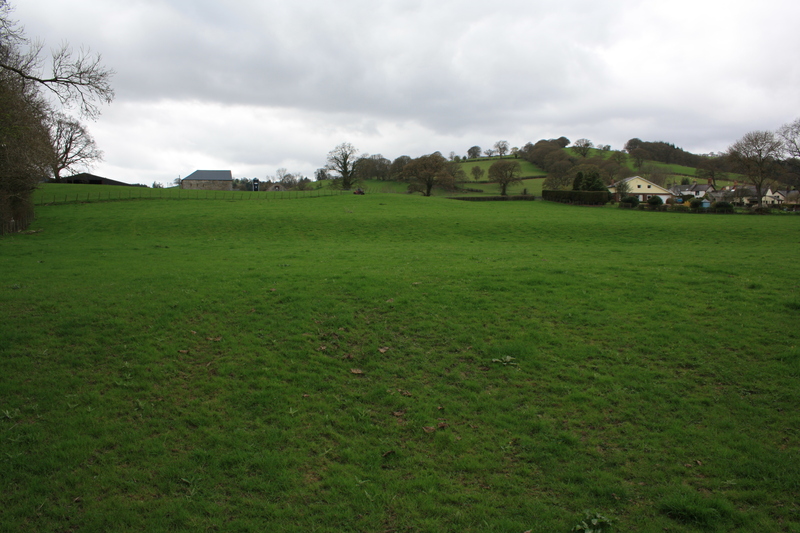 The removal of turf and also of a curious red soil that could be found at the site and which was rubbed into the backs of cattle to prevent disease was still remembered, if not practiced, into the early 19th century when recorded by Richard Fenton in his Tours in Wales. The area surrounding the chapel is certainly redolent with names suggesting a long religious tradition. 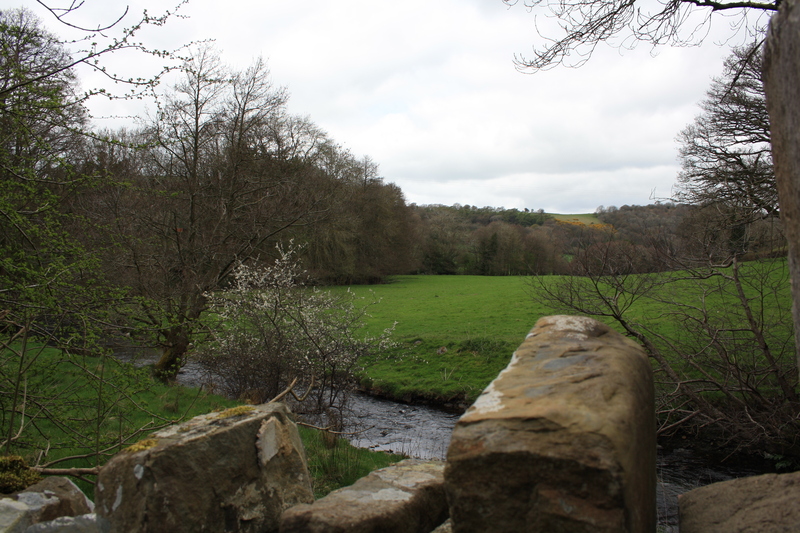 Leland in the 16th century identifies it as the burial place of a number of saints, the river that borders the site is crossed now by a bridge bearing the name Saints Ford, and the field across the river is Dol Sant – the Saints meadow. The history of Nantglyn implies that at one point in history it was divided, half bearing the name Nantglyn (or Nantclin) Sanctorum, and suggests that some residents paid their dues to the local abbot. Lhuyd records Nantglyn Sanctorum as being a place of sanctuary. The muddy lane running alongside Dol Sant is known as Lon Beti, possibly a corruption of Abaty remembering an abbey or ecclesiastical foundation once there. Finally, the farm on whose land this stands is now known as Glasmor, although historically this was Clasmor. Given that Clas is the term for an early Welsh ecclesiastical settlement then Clasmor, or Clas Mawr might indicate the presence of a foundation of some size. Clearly etymological evidence is everything here; there is little physical evidence on the ground. A geophysical investigation of the supposed site of the church in the early part of this century revealed next to nothing, and some trial trenches were put through the site around the same time, with a similar lack of results. It may be easily be hypothesised that several hundred years of local farmers removing turf and digging for red earth would have effectively disturbed and hidden any evidence that might have remained. The landowner did, however, indicate to us an alternative site in the next field northwards which appears from the contours to have been artificially landscaped and levelled at some time as a more promising site for potential church or ecclesiastical buildings. below: contours in the field sloping up towards the supposed site of Capel Mordeyrn at the top of the hill, at the left hand side. Levelled? That Nantglyn has once been at the heart of a significant religious and pilgrimage area whilst not proved is clearly realistic. Like so many sites there are few physical remains and so much is conjecture. Only old documentary evidence can ever shed light on the scale or importance of what was once here, though it is probable that Nantglyn was once home to one of a string of religious settlements scattered across Wales, latterly remembered as pilgrimage routes and then passing into folklore after the Reformation. The feast day of St Mordeyrn is not generally recorded, although Baring-Gould notes a record that identifies it as July 25th. Lhuyd in 1699 suggested that it fell on the first Sunday after St James, which forms a clear linkage between the festival of this saint and that of the dedicatee of the new church in the village.